These two very welcome double bill presentations from Fox will provide many UK genre fans with their first opportunity to view these films in their original theatrical aspect ratios. For many viewers the fact that 1958 version of The Fly (and, for that matter, Return of the Fly) was shot in Cinemascope, and also had stereo sound, will come as something of a revelation. Both films are transferred in 2.35:1 ratio, enhanced for 16:9 presentation. The sound on The Fly is 4.0 surround sound (at 384kbps); on Return of the Fly it's straightforward stereo (at 192kbps). The two fifties movies are in excellent condition. 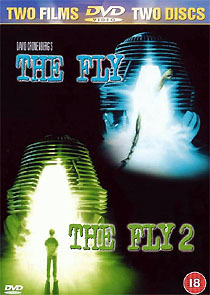 The 1986 version of The Fly and The Fly II fare relatively badly, with transfers that are no more than adequate. Both films are presented in 1.85:1 ratio, enhanced for 16:9 presentation. The audio on both is Dolby Digital 5.1. Choosing between the UK and US versions is not easy. In the US each pair of films was presented on a single dual-layer disc. 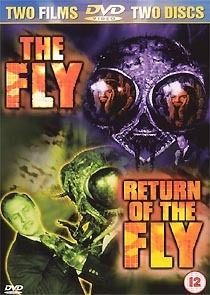 In the UK each film gets on its own disc, and three of them (Return of the Fly is the exception) are dual layer discs, which has resulted in slightly improved picture quality. The UK releases use the crippled 384kbps audio bitrate though: the American versions are presented at 448kbps. This is particularly disappointing in the case of The Fly, which has a terrific sound mix and a rich Howard Shore score. Each film comes with its theatrical trailer, but the US discs also have trailers for Voyage to the Bottom of the Sea and Fantastic Voyage (a double bill available in the US, but not yet in the UK).